Congratulations to Audra Mari for winning the Miss World America 2016 crown last July 8th at the Gaylord National Resort & Convention Center in National Harbor, Maryland. She will now have the right to represent the United States in Miss World 2016 pageant to be held in Washington, D.C. on December 20th. 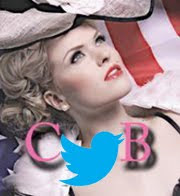 Audra will play host to over 100 contestants from all over the world. It will be the first time since 1991 that the United States will host Miss World. We are happy that Audra won; those of us who have followed Audra in her journey will recall that she was 1st runner-up at Miss Teen USA 2011 and then placed 1st runner-up again at Miss USA 2014. In both instances she represented her state of North Dakota. 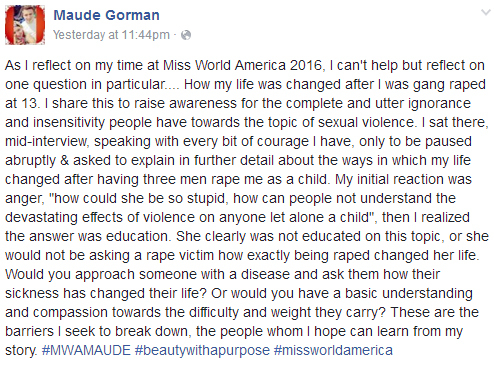 So when the news came out that she would compete in Miss World America 2016, many pageant fans were elated for her, but at the same time anxious. Why? Because of these nagging questions: "What if she places 1st runner-up again?" Or worse, "What if she doesn't place at all?" Audra Mari and her court. 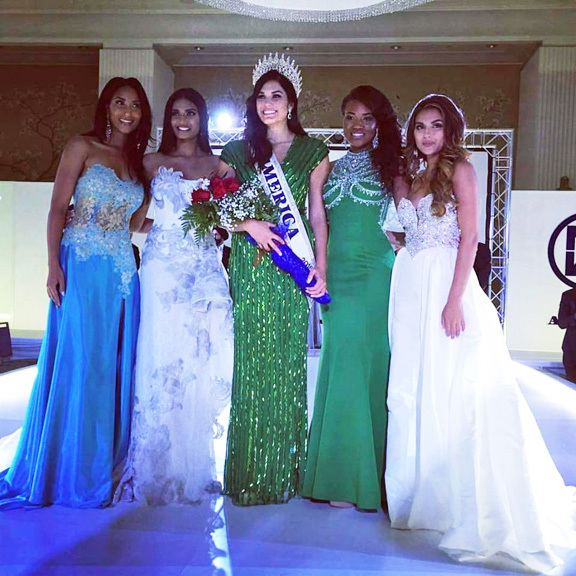 From left to right: Michelle Pierrot (2nd runner-up), Shivali Patel (1st runner-up), Audra, Sasha Perea (2nd runner-up), and Andrea Hightower (4th runner-up). What is wrong with this picture? 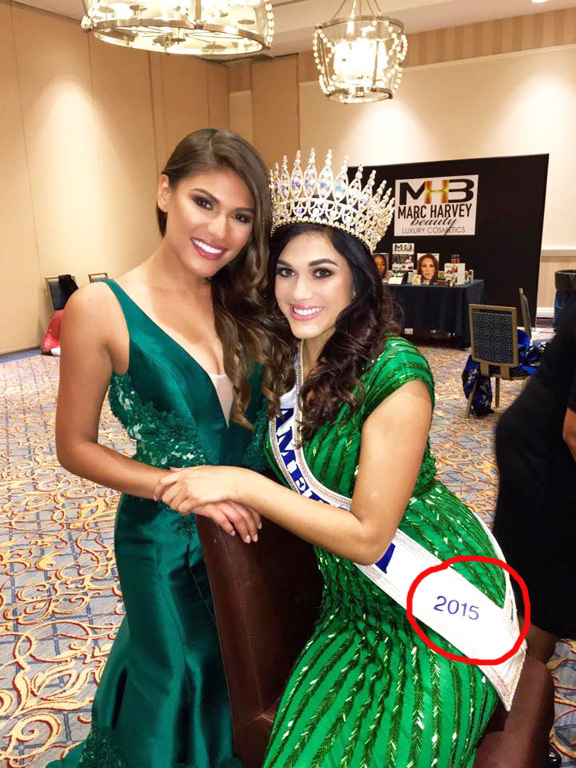 Why is the newly crowned 2016 winner wearing outgoing queen Victoria Mendoza's 2015 sash? Was this photo taken BEFORE Audra Mari was declared winner on stage? This photo is posted on Victoria Mendoza's Facebook page. 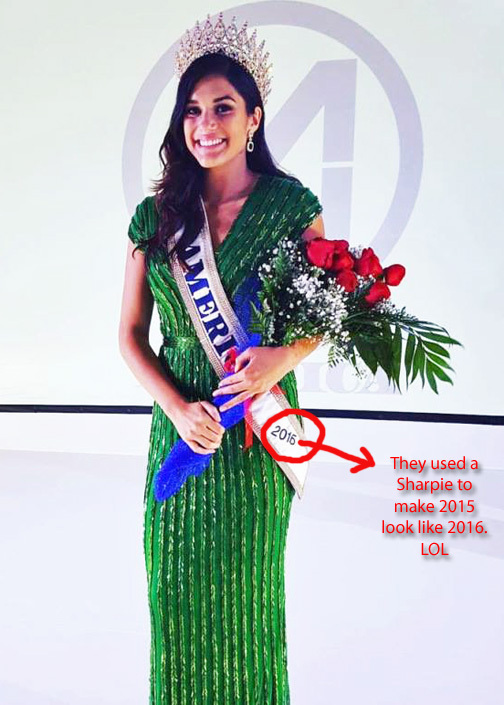 A reliable source informed Critical Beauty that a Sharpie was used to modify the year "2015" to make it look "2016" because the organizers apparently had either failed to order a 2016 sash or that they had one but it went missing? Talk about shortsightedness. And don't be fooled by the crown; it was the same crown that Victoria had worn during her reign. 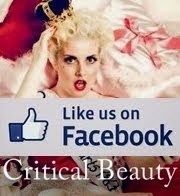 Let's get down to the nitty gritty. The names of the judges were not revealed on the official website or anywhere on social media. It seems that there were different judges for different events, and certain judges got to judge one or two events including the finals. Last year, there was a leader board that allowed the audience to see how the contestants progressed during the competition. It was not the case this year, thus, the lack of transparency in the scoring system. Two girls, Tarese Taylor from Baltimore and Tarynn Shelman from Houston, placed in the Top 12 even though neither one had won or placed in any of the seven challenge events (Beach Fashion, Sports & Fitness, Top Model, Beauty With A Purpose, Interview, Talent, Miss Photogenic). Meanwhile, Amara Berry from Providence, Rhode Island, who won the Beauty With A Purpose (BWAP) challenge - the most crucial and most important one and which bears the catchy slogan of the pageant - did not even make the Top 12. Go figure. One of the front runners, Christina Denny, who had to relinquish her Miss Maryland USA 2016 title just to compete in MWA, was shockingly shut out of the top 5 (though she placed in the top 12). Denny was in tears and she reportedly walked out of the stage after the top 5 finalists were announced, although she returned to the stage after Audra's coronation. One wonders if the only reason Denny decided to compete was that Chris Wilmer, the pageant director, had wooed Denny to sign up by promising her the crown. It is also possible that Wilmer had used Denny to gain more publicity, or at least to add another one or two pretty girls to the roster because frankly, most of the girls this year looked mediocre and out of shape. Another front runner, Rachel White from Texas, who competed last year and placed 2nd runner-up, also failed to make the top 5 this year. We did not learn about the identity of some of the judges until a day after the pageant. One of the judges turned out to be former Miss Botswana, Emma Wareus, who was first runner-up to Miss World 2010 Alexandria Mills. Other judges included Miss United States 2014 Elizabeth Safrit and her mother, Lynn Safrit, Mr. World America 2016 Alexander Ouellette, Joseph Han, Julia Nesheiwat, and Susan Robinson Day (I have absolutely no clue who these last three individuals are). 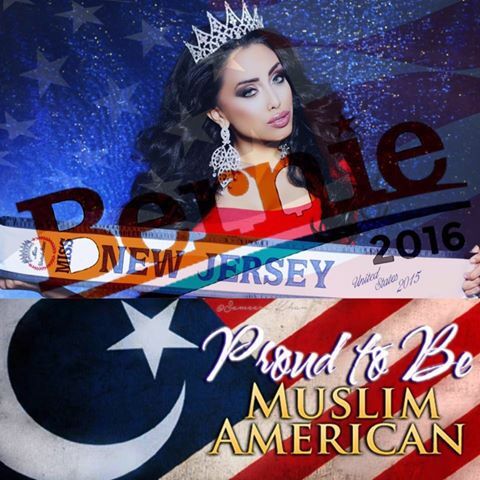 Meanwhile, as Victoria Mendoza was doing her final walk, one of the contestants who failed to make the cut, Sameera Khan (a former Miss New Jersey United States 2015) disrupted the moment by making a political statement on stage. 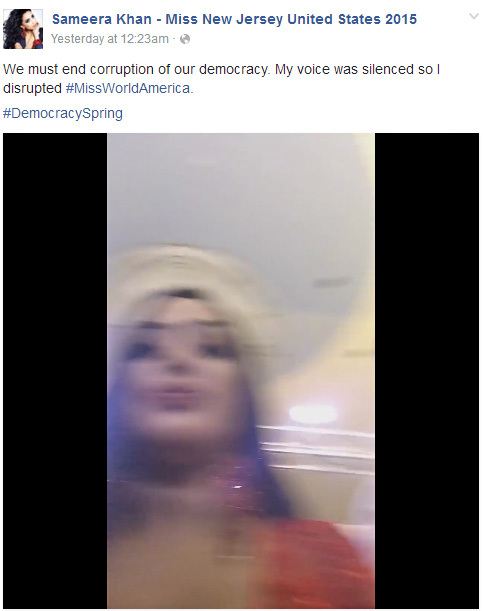 In a 14-second video clip - that she apparently recorded herself while holding her cellphone from a lower angle - she says: "I rise today in protest against corporate greed. Our democracy has been stolen, our voices have been silenced and plutocracy has taken over." Say what? The Islamic Crescent and Star replace the 50 Stars of the American flag. 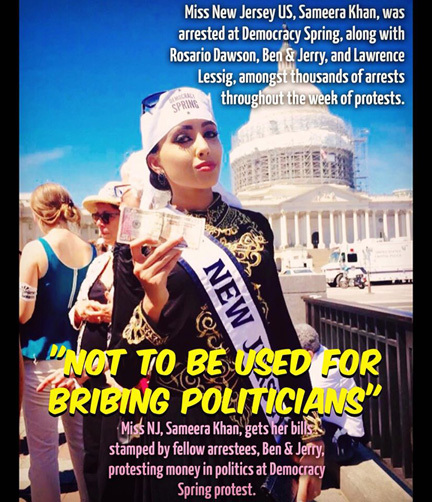 Could Sameera's real political agenda be the Islamization of the United States of America? 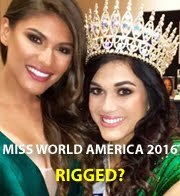 I am amazed why the Miss World America organizers accepted Khan as one of the contestants without properly vetting her background, because her little soapbox drama on stage might have scared the living daylights out of the contestants and of the audience (especially the children). Not to mention the lack of security at the venue! And the pageant came on the heels of three successive tragic days when two black men and five police officers got shot and killed. Don't get me wrong; I admire beauty queens who have strong opinions about politics or other issues, but expressing your political opinion during a special moment is just plain rude and disrespectful. Express your political opinions off stage or when the pageant is over, but not when the outgoing queen is doing her farewell walk. Show some class and decorum! If you were in Victoria's position, would you want a fellow contestant disrupting your final walk? Ummm... I don't think so! Anyway, Khan's absurd little spectacle is reminiscent of past ugly incidents in pageantry initiated by rabid feminists who despise pageants because they think that they exploit women and girls. 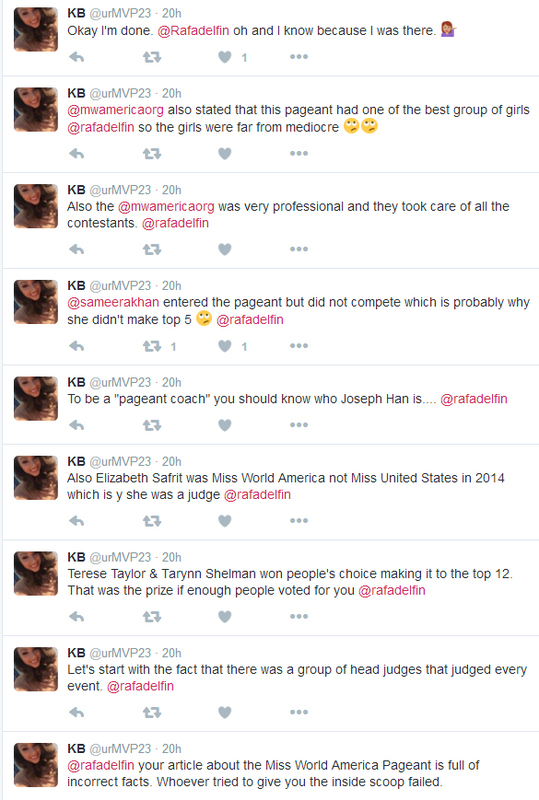 However, Khan may have made history by being the first contestant to disrupt a pageant while videotaping herself. I wonder if she had been holding her cellphone during the entire competition. Though I admire her strong convictions, I strongly disapprove of her choice of moment to express them. No wonder she didn't even make the top 5 in the BWAP challenge. 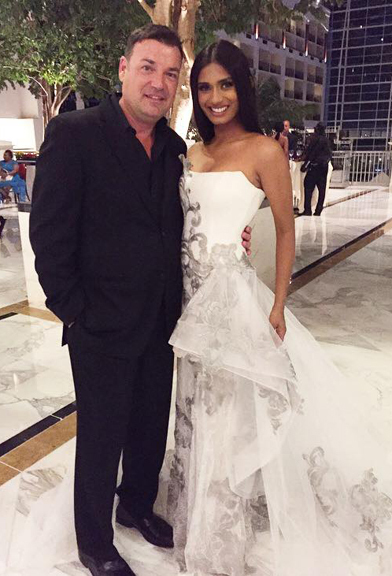 MWA Director Chris Wilmer with first runner-up Shivali Patel. From Sharpie-fixed sashes to questionable results, from lack of security to insensitive judges. What else was wrong? Disorganized events, changes made at the last minute, and inadequate meals (except for a handful of complimentary meals). The official website leaves something to be desired; there is no direct contact information, no information on the staff, no physical address - which should all be red flags to potential contestants. There was no biographical information posted on each of the contestant, which suggests inefficient or lack of administrative skills on the part of the organizers. A People's Choice contest had been launched which required voters to pick their favorite by clicking on her photo and to donate any amount, but a day after the pageant all photos have been taken down, and no People's Choice winner was announced during the show. How much of the monies were collected and donated to a charitable cause (if they even have one), or was this just another one of the organizers' quick money-making schemes? No one will ever know... except the pageant director himself, Chris Wilmer. So is anyone attending Miss World 2016 in freezing Washington, D.C. this December? July 12, 2016: Sameera Khan tweeted that she didn't interrupt Victoria Mendoza's final walk, but interrupted the host and Victoria's farewell speech. She also stated that she did not compete (Wikipedia states that she withdrew from the competition).